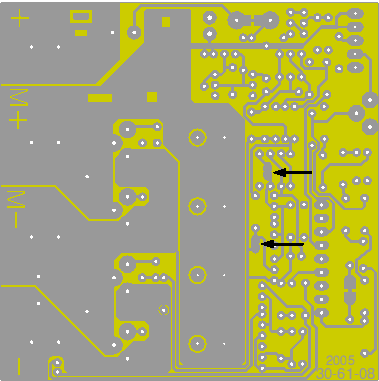 From Issue 7, two scratch-through links are present on the circuit board. If both of these are broken, regenerative braking will be disabled. However this modification is not recommended: our experience shows that in almost all applications it is best to leave regen braking properly enabled. In particular, be aware that as a modified controller has no control during deceleration, if the controller’s deceleration ramp is too short, the controller will reach zero speed before the motor does. In that event the controller will short out the motor which will them stop more or less violently. The two links to be broken are indicated by the black arrows.